This is a kit version (assembly required) of the Large Iris card. The Large Iris card is the size of a typical greeting card 5" x 7". It functions as a mechanical iris similar to those used in photography aperture mechanisms. A tab on the card can be manually rotated to progressively open the hole in the center of the card up to a maximum size of two inches. The card also has slots on the reverse side which can hold a 2" x 3" photo that will be partially revealed when the iris is opened. See the video below for a demonstration and assembly instructions. The optional envelope is just a plain white envelope. The card varies in thickness, but is approximately .09" thick at its thickest point. See the video below for assembly instructions. This listing is for the unassembled card kit; the fully assembled version can be found here. 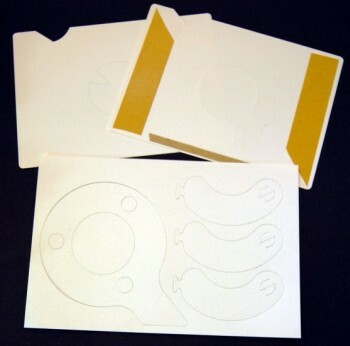 Printing note: For the card kits I can only print on the big sheets that make up the front and back of the card and not on other features like the center of the iris or the arm. About Templates: I'll work on getting a better template selection for the future, but in the meantime if you want one of the designs seen in the video with only a change to the text or color you may select the template printing option. Assembly does require some finger dexterity and care. Refer to the video to get an idea of difficulty level. Most people don't know what to do with a card like this if you just hand it to them. It is usually a good idea to show them how it works as you are giving it to them, or include some printed indication of how to use it if you are sending it as some kind of greeting card.